New Zealand police say they have been contacted by potential victims from around the world after a local man was charged with drugging and indecently assaulting tourists in a lodge. 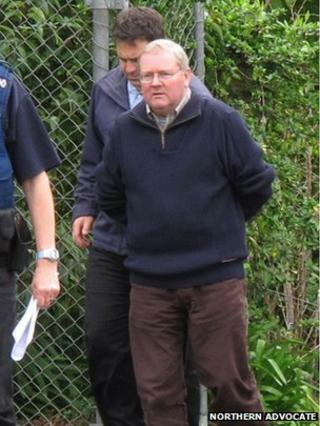 Michael Harris, 56, is said to have made "intimate visual recordings". He was charged on Wednesday with harming 16 victims, all men aged between 18 and 25 years old. The offenses allegedly took place at the Main Street Lodge in the northern town of Kaitaia. Police released a statement on Thursday calling for more witnesses, saying they particularly wished to speak to anyone who stayed at the lodge in the past two and a half years. They said they had already been contacted by potential victims from New Zealand, Germany, England, Scotland and the United States. The New Zealand Herald said that many of the victims were believed to have stayed temporarily in the main dwelling of the lodge during that period. The lodge has backpacking facilities, hotel units, and longer term accommodation in the owner's residence. A police spokesman was quoted by the paper as saying: "These victims are unlikely to know that something has happened to them, although they may have suspicions." Harris faces a total of 39 charges related to indecent assault, aggravated wounding - specifically the drugging of a victim to facilitate an indecent assault - as well as the making and possession of "intimate visual recordings". He will appear in court again next week. Kaitaia is located on New Zealand's North Island, and is known as the "gateway to the far north", according to the New Zealand tourism website. It has a population of around 5,200. There are several attractions in the vicinity including the lighthouse of Cape Reinga - near the northernmost point of New Zealand.